The Champagne Quilters met last night. I wanted to attend a guild meeting Wednesday night and asked Marg if we could meet Thursday night instead. She is very accommodating. Ann even managed to come out. 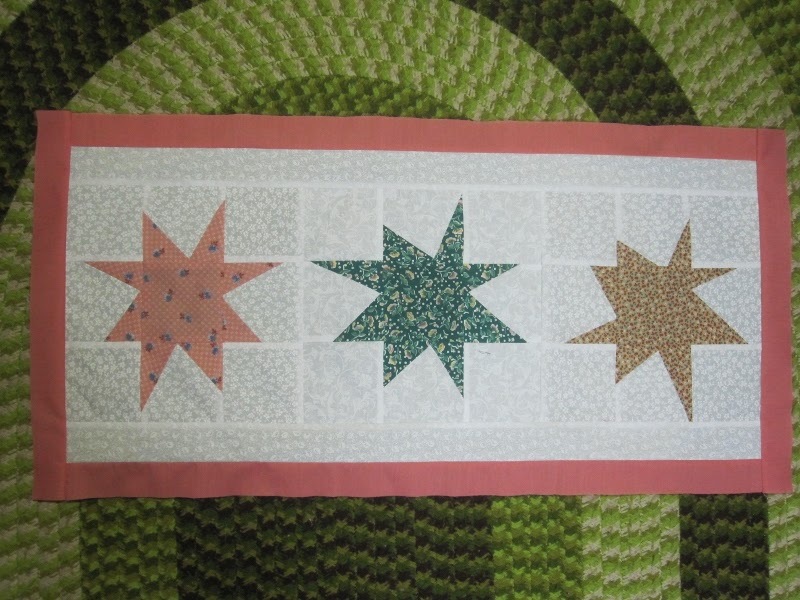 These are the bigger crazy stars that we had left. They were trimmed down to about 12.25 inches since the edges were all uneven. Since we didn't need the length so much as the width, Marg found some white on white so I added a two inch border to the sides. Next up was the frame that ended up being 1.5 inches finished. Then we added this strip. Notice that it is not the same size on the ends as on the sides. Once again we started auditioning what would come next. I'm not really a fan of this colour. We didn't come to any solid conclusion so we decided that we would leave it for a week and decide later what we wanted to put on it next. It measures about 23 inches by 40 inches so far. One week when Marg and I were talking about the charity that these quilts will be going to, I mentioned the little hats that I was knitting. Marg asked if crocheted hats would be okay and I said yes, of course. Well, here they are. She made five. A lady at Marg's church brought over some fabrics (yardage, not scraps) for us and she even gave us the rubbermaid bin. One piece had a retail sales slip and the fabric was purchased in Buffalo, NY, at a Joann's in 1995. There was also a big baggie with all of this in it. 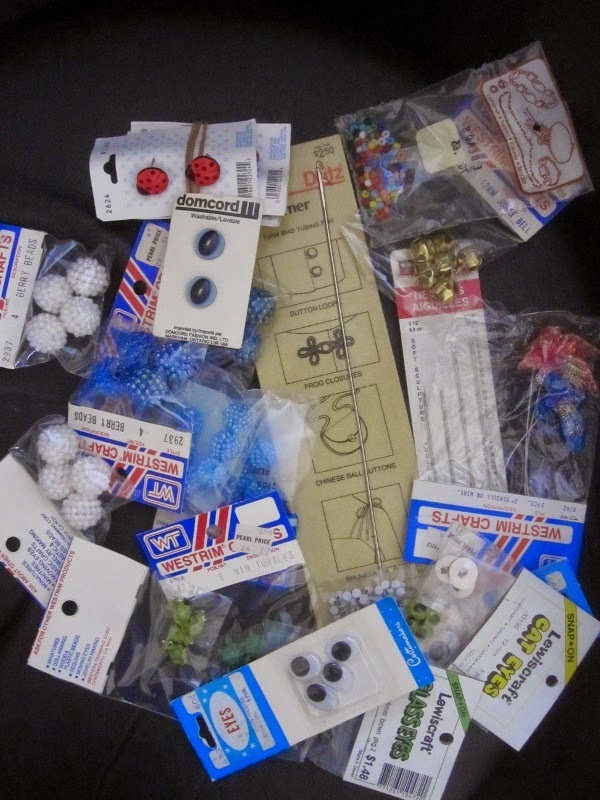 Beads, eyes, long needles, bells and other goodies. Since Marg doesn't make dolls and Ann doesn't either anymore, I took it home. There was a quite a bit of that paper ribbon or raffia looking stuff. I have no idea what to do with it. Oh well, if all else fails, I do have a Value Village just down the street from me. I leave you with a photo of my tulips. These were a treat to myself. Pretty tulips - maybe soon we'll see them in gardens - we can only live in hope! Delores, your runner is coming along nicely. 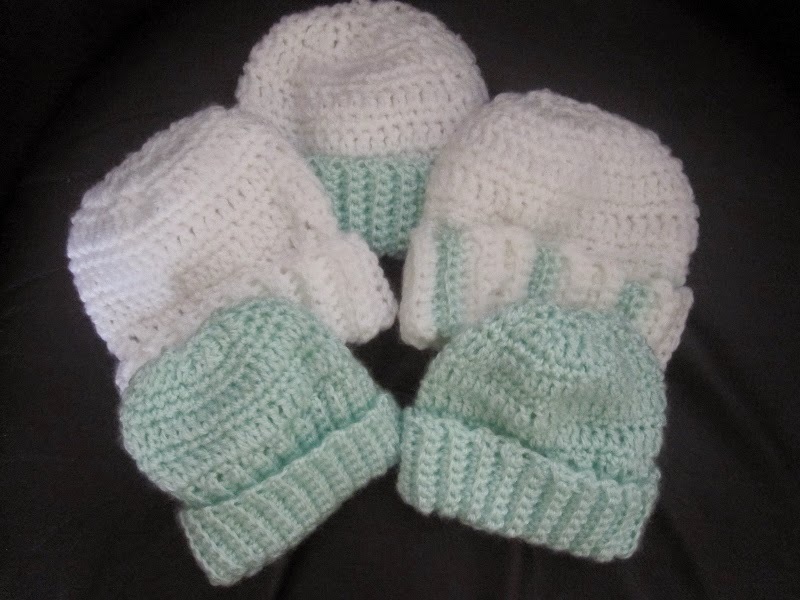 I would like to crochet some hats for the natal unit at our local hoot all. Can you ask Marg where she got her pattern? Lovely additions to the runner/small quilt?, and gorgeous tulips, and in NZ the SCBU or similar always appreciate tiny hats and bootees. Always nice to get quilty 'stuff'. 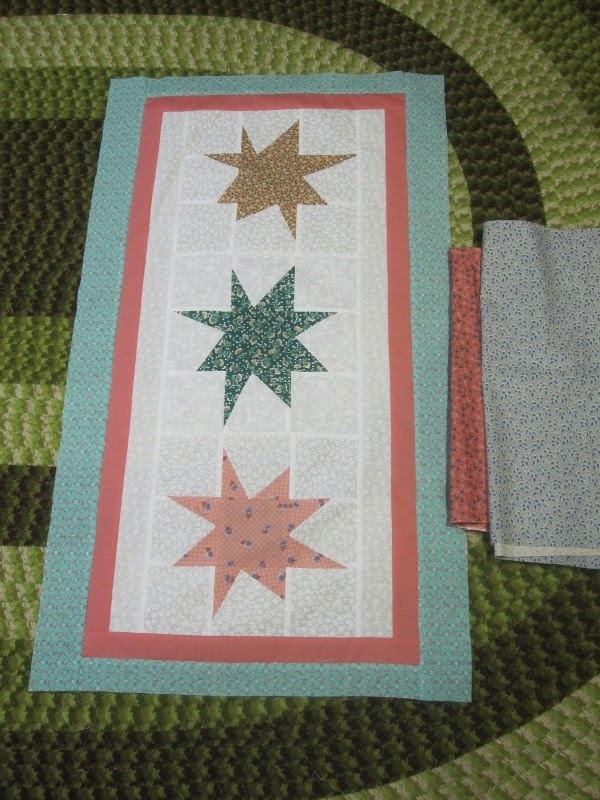 Your table runner is coming along nicely. Love the hats. And those flowers... beautiful. A great gift to yourself. Great little runner! Those tulips are beautiful...just what we need here with yet another snow storm coming tonight! I think the new fabrics will look fine here, the grey balances the not so lovely colour. I believe the paper ribbon was used to make wreaths or flowers, if the colour is OK for that. Or just binding almost anything. Cheerful tulips! 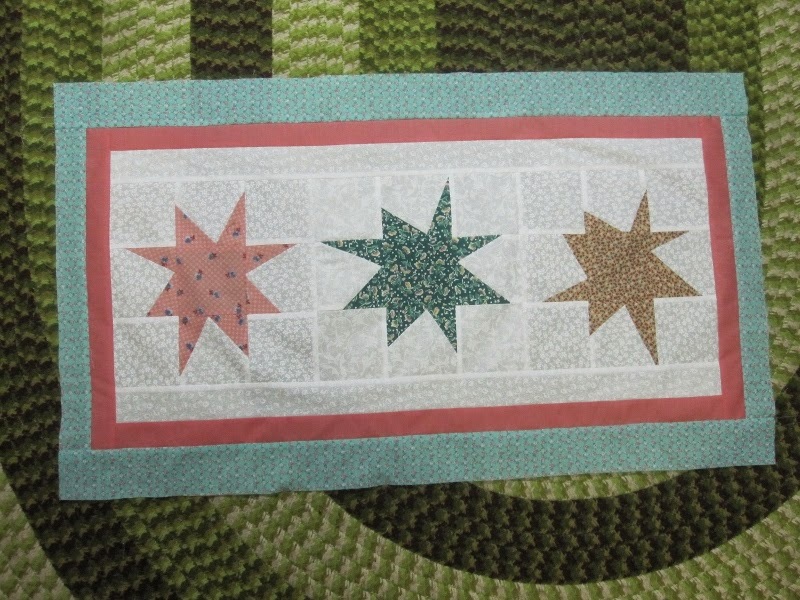 I like seeing the progress on the quilt. 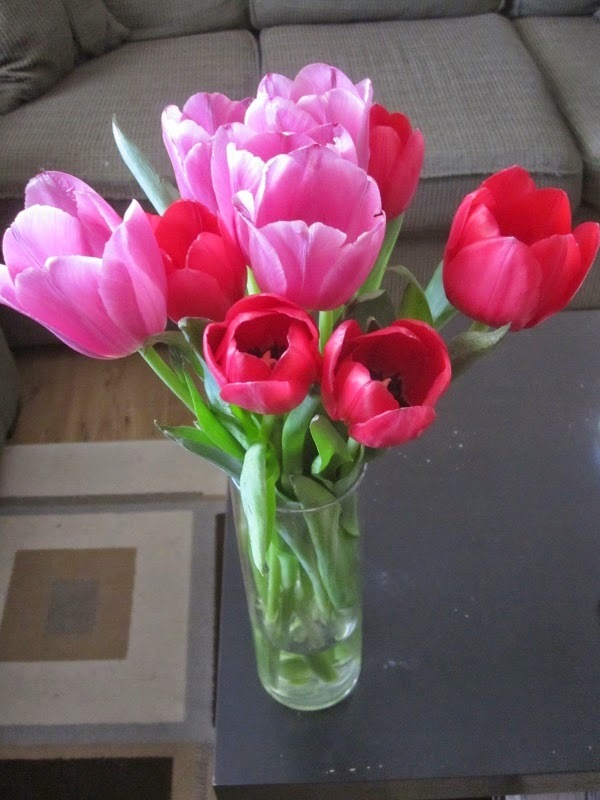 Tulips are such a pretty sign of spring coming - a perfect treat for yourself. 1995! Now that's holding on to stash. I love watching the quilt grow, and the little hats are sweet. LOVE the stars. How nice of Marg to make those hats! And how nice of that lady to donate all that. Not sure what I'd use the raffia for - probably a donation, lol. Your tulips look lovely - I'm going to get some on the first day of spring, it always cheers me up! 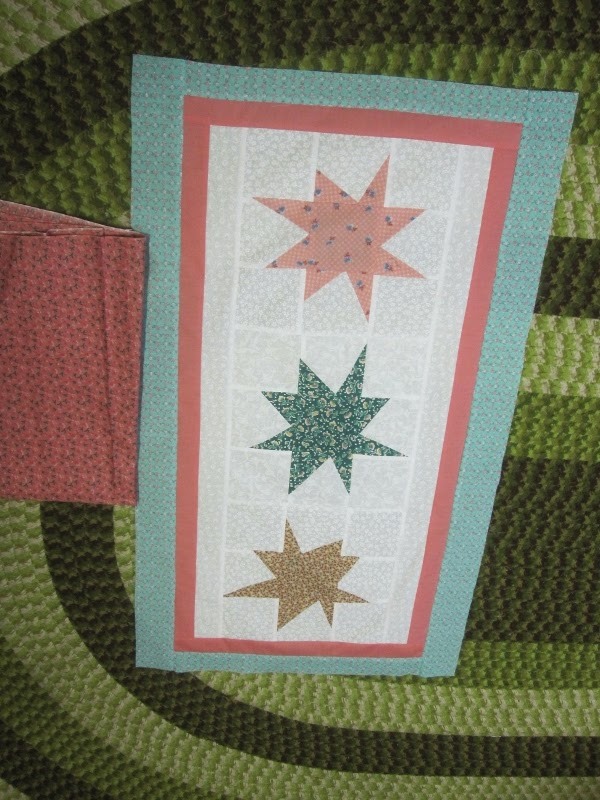 Difficult colors for me, the star quilt. I think I would see if you have something dark greenish for the small border.